The Millennial generation, which began entering college in 2000, is bringing profound changes to higher education and the workplace. Emory Photo/Video. The Millennial generation, that group of people born between 1982 and 2001, will be 50 percent of the American workforce by 2020, according to the federal Bureau of Labor Statistics. The generation has already created profound changes in both education and work environments, according to Andrea Hershatter of Emory's Goizueta Business School. Through her work as Goizueta's senior associate dean of undergraduate education, director of the BBA program and senior lecturer in organization and management, Hershatter began studying and researching the Millennials' influence on the workplace and societal institutions, including educational ones. She frequently works with managers and educators to help them better understand a generation shaped by hands-on parenting, expansive access to technology and different ideas about everything from diversity to organizational hierarchies. Hershatter shares her perspective on Millennials and their relationship to the preceding generations — the Baby Boomers, born between 1946 and 1964, and Generation X, born between 1965 and 1982 — as well as how they might affect the workforce and how they have affected Emory. How did your expertise on working with Millennials in the workforce evolve? My area of expertise has emerged from continuously working with a college-age population, which has shifted over that time from Generation X to Millennials. I became interested in the topic right as the Millennials were entering college, which was 2001-2002. It was becoming apparent that some things about the new cohort were different. Elaborate on the background of that shift. A lot of changes in student attitudes and expectations were gradual. Somewhere on the cusp of the college-age generation shifting, a different kind of student began to fill our classes. There was an enhanced desire for guidance, support and feedback, and expectations about infrastructure and support began to increase. Probably the first signal was an uptick in the number of very, very hands-on parents. Over time, it has also been the case that Millennials look a bit different from the generation that preceded them: There are now more women in college than men, and at every level there are more women who are taking on leadership roles in organizations, and who have the expectation of a level playing field in the workplace. Similarly, there are more previously underrepresented minority populations staying in the educational pipeline and a large number of students and new workforce entrants for whom English was not a first language. This is a generation that has much more experience working with people of diverse backgrounds and one that has been exposed to a wide range of perspectives. In the United States, more than 40 percent of Millennial adults are non-white, which is a fairly dramatic demographic shift. What differences do you see between Generation X and Millennials? Generation X, I think very unfairly, got saddled with a slacker reputation. What really happened was that this population was not particularly well served by societal institutions. They were blamed for declining standardized test scores that were really the result of a shifting canon in the school system. They became "latchkey kids" because their moms went back to work in large numbers but there was not yet the childcare and after-school infrastructure that we now have in place. Left to fend for themselves, they became self-reliant, resilient and pragmatically entrepreneurial. It is not surprising that when they were in college, they did not have much patience for seemingly arbitrary rules and what they considered to be outdated paradigms. Much of the GenX coming-of-age experience stands in stark contrast to the institutionally supported, parent-protected experience of Millennials who have consequently become the somewhat risk-averse, resource dependent, engaged university citizens we see at the moment. What is distinctive about the Millennial generation that might influence the ways in which they approach the workforce? There are two key themes that really distinguish Millennials. The first is their relationship with technology and the second is their relationship with institutions. Obviously, there is much that has been written, both positive and negative, about Millennials' facility with and reliance upon technology. I think the major takeaway is that they are far more likely than any older generation to treat technological devices as a sixth sense. It is as much a part of how they know and interact with the world as is seeing and hearing. In terms of their interaction with institutions, I think their propensities come from the fact that according to what Strauss and Howe call the "4th Turning," Millennials are being prepared by their parents and society writ large to become the next Great Generation [born 1901-1924], in order to fill the societal gap being abandoned as the GIs age out of the population. Boomers especially seem to recognize that Millennials are inheriting a world in crisis that they will be called upon to address. As a result, as parents and educators, we have filled the Millennial toolbox with as many instruments as possible: access to the best education each family can afford, lessons and activities of every imaginable sort, and broad life experiences. In the process, parents have become very active consumers of services and educational institutions designed to serve the needs of Millennials. And that has brought about a real change. Instead of the kind of parents who raised most of us and trustingly believed that educators would do what was best, both GenX and Boomer parents of Millennials have been very vocal in outlining how they believe the institution should accommodate and equip their children. 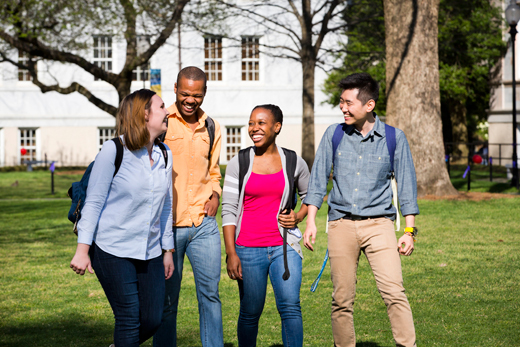 How has this impacted Emory in serving its students? Across the board every educational institution will tell you they are devoting two, three or even four times more time, human and financial resources as they used to in nurturing, supporting and working with the current undergraduate population. As examples, providing living/learning residential communities, supporting an ever-increasing array of clubs and organizations, and offering amply diverse ways for students to get involved on campus and in community — all of which provide desired experiential learning and engagement opportunities — require people, infrastructure, physical facilities and money, all of the things it takes to run a university. And of course, these needs are in addition to the growing costs associated with fulfilling the core academic mission of research and teaching. Some people from outside academia are shocked at the rising cost of education, but from what I have seen, financial resources have not kept pace with needs. Instead, I think most people in the academy have had to work a little more efficiently and a lot harder. Do the infrastructure and support expectations held by Millennials have the same effect in the workforce? I believe that many Millennials feel like it is not only their right, but also their responsibility, to help the organizations with which they are affiliated understand what they need in order to reach their potential and do their best work. Millennials are very open to the prospect of reaching out to supervisors, for example, to say, "Here's a way I would like you to behave that would help me be a better employee for you. I need weekly meetings, I need feedback more often, I need an example of a project you've liked before so I can emulate it, I need mentorship…"
In the face of this, some of us may observe a sense of entitlement, but I think it is really more of a millennial imperative. Many of them feel massive pressure to succeed and are seeking to create an environment in which they feel they can meet those expectations. What are parents telling their college-age children about choosing careers? The parental generation shifts halfway through the coming-of-age generation. So Boomer parents of Millennials, with great gusto, encourage their children to do what they love and to find their passion. The message is that if you find something that you care about, you'll be good at it and the money will follow. And I will tell you that consequently many of their children are still living at home, still searching for that elusive thing that makes them passionate — which is not to say it's bad advice. It happens to be a message that I give my own children. But that is definitely a Boomer ideal — I'm a Boomer-Xer cusper — the message that comes right after mine is entirely different. What many Gen-X parents tell their children sounds much more pragmatic: "Go out, get a job and learn how to support yourself. You can find passion elsewhere in your life and if you're lucky, you'll find a way to some day marry the things that you love with your profession." What does this mean for Generation X managers? At work, Gen X is caught in the middle of the Boomers and Millennials. Boomers, who by and large, don't have to change their day-to-day behavior to manage Millennials, see in them a young, eager population that wants to belong to an organizational family and share its ideals. On a high level, this approach to the workplace is very much aligned with a Boomer mentality to seek meaning and significance, and maybe even their life purpose through work, and there's a real symbiotic relationship there. On the other hand, Gen X managers often feel initially less positive about Millennials. Part of this is because they already have more than they can handle on their plates. Managers in their mid-30s to early 50s have definitely been the end recipients of a recession-based middle management erosion that leaves them with more tasks but no more budget and ever-increasing expectations to do more with less. They are now also charged with managing a population that they sometimes see as very high maintenance, very needy and incapable of hitting the ground running the way that was expected of them in the 1980s and '90s when they entered the workforce. Based on your experience with Millennials, can you project a future? Millennials are interesting. Data shows them to be socially more liberal than previous generations, but at the same time, they self-report highly valuing traditional measures of security and stability like being married or in long-term relationships, owning a home, living close to family — all very conventional, traditional aspirations. They hold out the hope that they will do as well as their parents in terms of their financial security. But they don't necessarily expect that. At work, in order to thrive, many Millennials will have to become more resilient, more autonomous, and more capable of dealing with ambiguity than may perhaps come naturally to them. They have worked hard since they were very young, and I think they will continue to be hard workers. However, I also believe they will continue to push back against notions that one's life should belong to one's vocation, especially if they don't feel connected to the organization and passionate about what they're doing. Keep in mind that the Silent generation was horrified by Boomer hippies, and the Boomers were seriously worried about the alienated Gen Xers. So, I think, as has always been the case, as this new population becomes a majority in the workplace, older generations will have to give a little and accommodate a little and Millennials will have to grow a little and mature a little. By the time this happens, we will all be talking about the next generation!